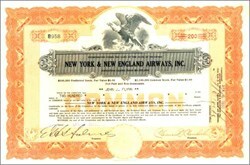 Beautifully engraved RARE certificate from the New York & New England Airways issued in 1933. This historic document was printed by the Hamilton Banknote Company NY and has an ornate border around it with a vignette of an eagle. This item has the hand signatures of the Company’s President ( Clarence D. Chamberlain ) and Treasurer. The New York & New England Airways was known for having Ruth Nichols as a pilot who was the first woman to be granted a pilot’s license by the U.S. Department of Commerce. In 1932, she was hired as a pilot by New York and New England Airways, becoming the first woman to work as a commercial pilot. In 1935 the noted flyers Clarence Chamberlain and Ruth Nichols carried passengers out of the Marlboro Airport in a Curtiss Condor plane, considered at that time to be the most modern aircraft used by any airline. Clarence Chamberlain ( 1893-1976 ) was one of that generation of aviators, including Charles A. Lindbergh, who contributed to the exciting and spectacular development of American aviation after W.W. I. Chamberlain is best known for his June 4-6, 1927 flight across the Atlantic which, by reaching Germany, broke Lindbergh's 2-week old distance record. In less spectacular, but perhaps more valuable ways, Chamberlain before and after his flight contributed to the growth of American aviation. He was a test pilot for Giuseppe Bellanca, a pioneer designer of aircraft who also built the "Columbia" [the plane in which Chamberlain made his historic June, 1927, trans-Atlantic flight], flying all of Bellanca's early planes to test their speed, mileage, handling, and safety. In August, 1927, he made the first trans-Atlantic airmail flight. In later years, he continued to test aircraft for a variety of companies, and served as chairman of the New York City aviation commission. Clarence Duncan Chamberlin was a versatile and dedicated pioneer of aviation who enlisted in the Aviation Section of the Signal Corps and earns his wings during World War I. But the war ends before he can get into action. After the war, he purchases the first Bellanca airplane ever sold and barnstorms throughout the East. Later, he deals in war surplus airplanes, engages in aerial photography and in tow sign advertising. In 1925, Chamberlin joins the Wright Aeronautical Corporation as a company pilot and soon convinces it to build an advanced monoplane designed by Guiseppe Bellanca, to demonstrate the abilities of the new Whirlwind engine. Later, he and veteran pilot Bert Acosta take the plane aloft over Long Island and set a world's endurance record of over 51 hours. On June 4-5, 1927, Clarence D. Chamberlain and Charles Levine in a Bellanca monoplane make first nonstop New York-Germany flight, 3,911 miles, in 43 hours, 49 minutes, 33 seconds. This was just one month after Charles A. Lindbergh flew the Ryan monoplane, Spirit of St. Louis, in the first nonstop solo transatlantic flight, 3,600 miles, from New York City to Paris, in 33 1/2 hours. After an adventure-filled flight, they land safely, out of fuel, near Mansfeldt, Germany, completing the record setting flight in 43 hours. Later, he returns to a hero's New York ticker-tape parade welcome. After serving on the famous Baker Board investigating military aviation in 1934, Chamberlin opens an airline between New York and Boston called the New York & New England Airways. Afterwards, he uses its four Curtiss Condors to barnstorm the country and during the next five years, he takes hundreds of thousands of passengers aloft, most for their first flight. Later, as war clouds threaten in Europe, he opens a series of aviation trade schools vital to the war effort. After the war, he serves briefly as sales manager for the Bellanca Aircraft Corporation. Everyone has heard of Charles A. Lindbergh, the first man to fly the Atlantic. But does the name Charles A. Levine ring a bell? Likely not. Yet seventy-five summers ago the two men were locked in a battle for aviation history -- one as a pilot, the other as a promoter. Levine, a 30-year-old millionaire who had made his money buying and selling World War One surplus materiel, had entered the competition for a $25,000 prize for the first person to complete a nonstop flight from New York to Paris. Lindbergh beat him to it on May 20, 1927, but the following day the young entrepreneur announced that his privately owned airplane would presently fly farther faster -- and with a "mystery passenger" aboard. The pilot, he stated, would be one Clarence Chamberlin. The mystery passenger remained a mystery. On June 4, 1927, thousands gathered at Roosevelt Field on Long Island, New York, to witness the takeoff. While they waited, Charles A. Levine climbed into the back of his plane and had Chamberlin taxi him around the airfield. No one thought much of it until the plane was halfway down the runway and gaining speed. Suddenly it was clear: The mystery passenger was none other than Levine himself. The millionaire's wife fainted. His children wept. The press had a field day. Forty-two hours later, Levine and Chamberlin ran out of gas and landed safely in a peasant's wheat field in central Germany. Despite being 40 miles short of the intended destination of Berlin, Chamberlin had smashed Lindbergh's distance and speed record. And Levine had become the world's first transatlantic air passenger -- as well as an international hero whose face was plastered across newspapers from Europe to America. The euphoria was greatest among American Jews, for whom Levine was a new symbol of Jewish courage and fortitude. Yiddish radio stations and newspapers covered and re-covered the story and Jewish musicians wrote songs about him. It seemed Levine had made history.